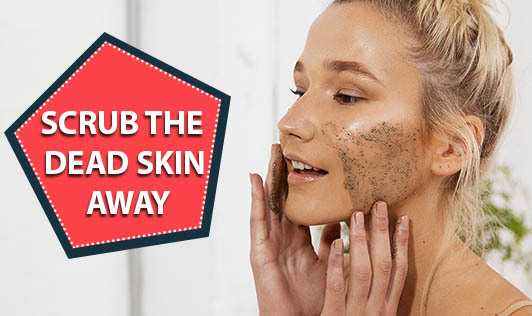 When you realize you have a patch of dry dead skin, the first thing that strikes your mind is to scrub it with a mixture of ingredients that are available at home. With the use of products such as salts, sugar or herbs, the skin is exfoliated by removing the dead skin there by giving a fresh glow to the skin. When you scrub your skin, it encourages circulation of blood and body fluids, thereby, giving a subtle glow and a relaxing feel to your skin. It is also known to reduce aging. • To 1 cup of course sea salt, add half a cup of baby oil or any vegetable oil. Let it sit for 24 hours. Massage your body with this for a few minutes and rinse. • To 1 cup of sugar, add 1 table spoon of milk powder and half cup of coconut oil. Mix all the ingredients well and massage on the skin for a few minutes and rinse. • To half a cup of coffee powder, add half a cup of sugar and half a cup of almond or any other nut oil. Massage this mixture on the skin for 15minutes and rinse. • To half a cup of fresh lime juice, add half a cup of granulated sugar, 1table spoon of olive oil and 1 table spoon of honey. Mix it well and massage it for 25 minutes and rinse well. • To one handful of almonds, add 1 orange peel and 1 cup olive oil and blend it in a mixer to a course paste. Massage this mixture on the skin and rinse. • To one part of sea salt, add two parts of fresh honey. Mix well and massage it for 30min twice a month. • To 1/4th cup of granulated sugar, add 2 table spoons of almond oil and 2-3 chopped strawberries. Mix well and smash the strawberries a little and massage on the skin. So, get ready to try these scrubs and shed the dead skin away. Give your skin the perfect glow!